Two-Dimensional (2D) materials have been widely studied since the discovery of graphene in 2004. Many of the initial works on the various 2D materials (graphene, MoS2 and other transition metal dichalcogenides, black phosphorus, and others like the monochalcogenides) by mechanicians focused on issues like ideal strength, and appropriate methods to calculate the bending modulus. Some of these, and other issues, were reviewed by Sulin Zhang in a J-Club from March 2015 (http://imechanica.org/node/17999). That was a nice J-Club that focused on 2D membranes, both crystalline and biological. For this J-Club, I wish to focus the discussion entirely on crystalline two-dimensional materials. In particular, I hope that by giving contemporary examples below of how mechanicians are contributing to this field, this might stimulate discussion as to how our community can continue to contribute and advance this field in the future. (http://journals.aps.org/prb/abstract/10.1103/PhysRevB.90.245437), or introducing large scale voids in a nanomesh pattern (http://scitation.aip.org/content/aip/journal/apl/104/17/10.1063/1.4874337). In addition to finding engineering solutions to existing mechanical property deficiencies, there exist many opportunities to discover and explain novel mechanical behavior and properties that may be intrinsic to 2D materials. 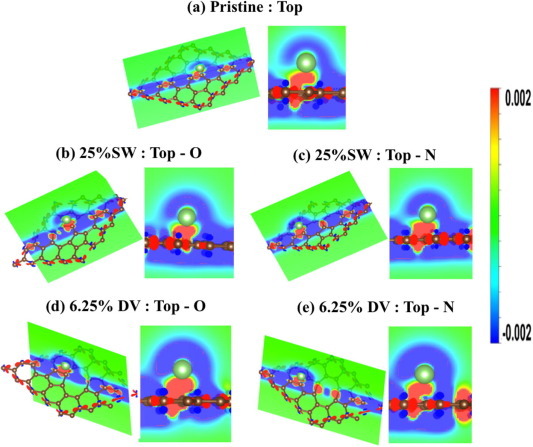 Examples include auxetic behavior in single-layer black phosphorus (http://www.nature.com/ncomms/2014/140818/ncomms5727/full/ncomms5727.html) and graphene nanoribbons (http://pubs.acs.org/doi/abs/10.1021/acs.nanolett.6b00311), and novel defect mechanisms like ripplocations (http://pubs.acs.org/doi/abs/10.1021/nl5045082), grain boundary engineering (http://www.nature.com/nmat/journal/v11/n9/abs/nmat3370.html), and nonlinear mechanical behavior (http://journals.aps.org/prb/abstract/10.1103/PhysRevB.87.035423). Another area that has gained significant interest recently is that of elastic strain engineering, where mechanical strain is used to tailor, or enhance or physical properties. Examples include thermal conductivity (http://journals.aps.org/prb/abstract/10.1103/PhysRevB.81.245318 and http://iopscience.iop.org/article/10.1088/0957-4484/22/10/105705/meta), electromechanics (http://science.sciencemag.org/content/336/6088/1557.full and http://pubs.acs.org/doi/abs/10.1021/nn301320r), bandgap tuning for optoelectronics and photovoltaics (http://www.nature.com/nphoton/journal/v6/n12/abs/nphoton.2012.285.html), and optics (http://journals.aps.org/prb/abstract/10.1103/PhysRevB.87.155304). Of these areas involving strain, one promising avenue is the generation of pseudomagnetic fields in graphene, which occur due to strain gradients, and which result in pseudomagnetic fields measured experimentally (http://science.sciencemag.org/content/329/5991/544) and predicted theoretically to approach hundreds of Teslas, which is much larger than, for example, Earth’s magnetic field, which is on the order of 10-6 Teslas. Mechanics insight has recently been used to propose a feasible approach to generation of constant pseudomagnetic fields in graphene (http://journals.aps.org/prl/abstract/10.1103/PhysRevLett.115.245501). One area where this will be particularly relevant lies in the field of graphene heterostructures, where 2D composite materials with novel properties are made by stacking different 2D materials together, i.e. (http://www.nature.com/nature/journal/v499/n7459/full/nature12385.html). 2D materials are physically amazing, with complex relationships between mechanics, geometry, and electronic structure. It is for this reason that novel computational methodologies, that go beyond usage of molecular dynamics, may be one interesting path forward in this field. For example, coupling of molecular dynamics, tight-binding electronic structure calculations, and Landauer-Buttiker methods for transport have enabled interesting studies concerning the electromechanical behavior in larger scale (i.e. tens of thousands of atoms) graphene structures, as shown here (http://pubs.acs.org/doi/abs/10.1021/nl400872q) and here (https://arxiv.org/abs/1604.02697). Further advancements in this field would open new doors for mechanicians to study 2D structures at length and time scales beyond what is capable though standard molecular dynamics, DFT, or ab initio techniques. This J-Club is meant to give one snapshot of contemporary issues in the mechanics of 2D materials. Clearly, there are many fields not covered here that may be just as promising, if not more so. For example, the mechanics of graphene and other 2D materials interacting with liquids or biological systems was not covered. I hope to hear the thoughts and opinions of others in this field as to the areas and issues where mechanics can play a role moving into the future. Permalink Submitted by Dibakar Datta on Fri, 2016-06-03 01:09. Thank you very much for your exciting post. I always follow your great work ! I am looking forward to working with you in near future. Permalink Submitted by Harold S. Park on Fri, 2016-06-03 12:26. Dear Dibakar - thank you for sharing your nice work in this area, and congratulations on your new position! Since I know nothing about the energy storage issues with 2D materials, could you discuss some of the open issues in this field where you think mechanics researchers are particularly well-suited to attack them, as well as what you foresee are the appropriate techniques (experiment, simulation, etc) that will lead to the best insights?